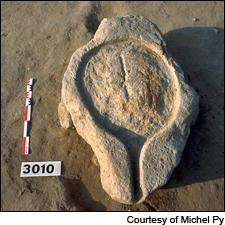 Evidence suggests this stone press was used in winemaking in 425 B.C. When Did the French Start Making Wine? "The question was whether it was an oil press or a wine press, and we proved that it is the oldest wine press in France through chemical analysis," McGovern told Wine Spectator. "There’s still the question of how the transfer of viticulture occurred, and what we showed here is that at least for southern France, it’s the Etruscans who are enticing the Celts or the Gauls into the wine market. Then it spreads up the Rhône and eventually establishes what is today’s primary wine culture." According to McGovern, the evolution of French wine production proceeded in phases. First, ancient Mediterranean civilizations such as the Phoenicians, Greeks and Etruscans began selling goblets and wine to the native Gauls. Then, as indicated by the stone press, the Gauls cut out the middle man and established native wine production around 425 B.C. The archaeological site surrounding the press supports the theory that trade and production went hand in hand. The earliest wine-related artifacts at the site consist of clay containers brought by Greek and Etruscan traders for sale to the native Gauls. A century or so later, local wine production, as indicated by the press, had emerged side by side with trading. “[The Celts and Gauls] imported some very fancy wine sets, made of gold or bronze, that showed off how wealthy you were,” said McGovern. "And if you’re going to import the wine vessels, you might get interested in making the wine yourself." To test the previous theory that the press produced olive oil, McGovern and his team utilized a mixture of chemical and archaeological evidence. Through the chemical tests, the researchers identified wine-specific compounds in the limestone of the press and then matched those compounds to residue found in nearby clay jars known to have contained ancient wine. Researchers also found grape seeds buried beside the press and identified structurally similar presses in ancient Etruscan paintings of wine production. Although 425 B.C. sounds ancient, it’s at roughly the same time as the life of Socrates. The new discoveries imply that France came to the winemaking game rather late. Traders from modern-day Israel and Lebanon brought knowledge of wine from the Mideast to North Africa, Greece, Spain and Italy hundreds of years before the French established their first winery. Those Gauls do seem to have made up for lost time, however.